Was it Confucius that said we should study the past to define the future? Well, it's true. I turned 48 today. Quite a remarkable age, I think. My father passed away at the age of 48. (To be honest, he died on the 5th of August, 1990. He would have turned 49 on the 20th of August, 1990.) I remember how much I wondered, at the time, what 48 must feel like. I was 24 going on 25. To me, 30 was the ideal age - probably because Jesus was baptized around that age. So, I thought 48 was still a very young age. I've reached my dad's age. I now know what 48 feels like. Given another 11 months, I'll know exactly what he could have felt like at the age of almost 49, had he not been ill ... I've been pretty emotional about reaching this age. Since I turned 46, I have often wondered how long my life will be extended. I do believe we are all here on earth for a specific purpose. I'm not sure what my purpose is other than teaching and making an educational difference in a teenager's life, but, while I am here, let me continue doing what I do. One thing I will never forget about my father was his passion to broaden our horizons. He used an atlas and encyclopedias back then to sharpen our minds. 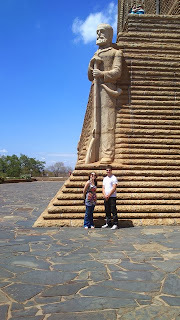 When we came to South Africa in the 80's, he took us to the Voortrekker Monument in Pretoria. 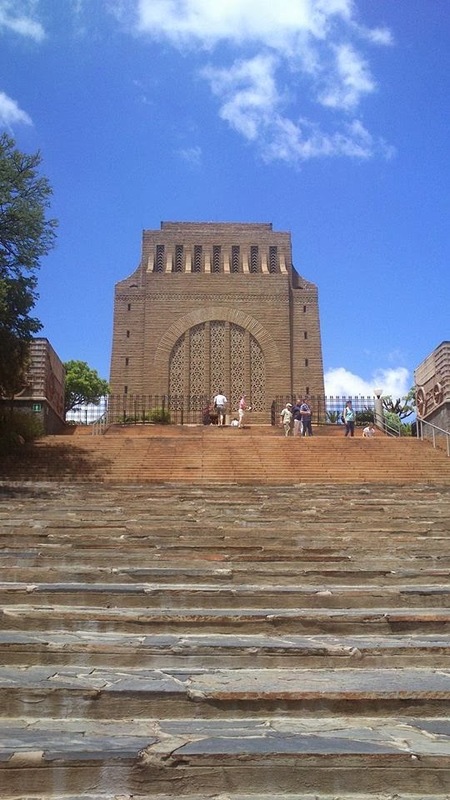 my father's fear of heights, making us stand back from the edge of the balcony, not allowing us to look down; all we could do was admire the view of Pretoria. 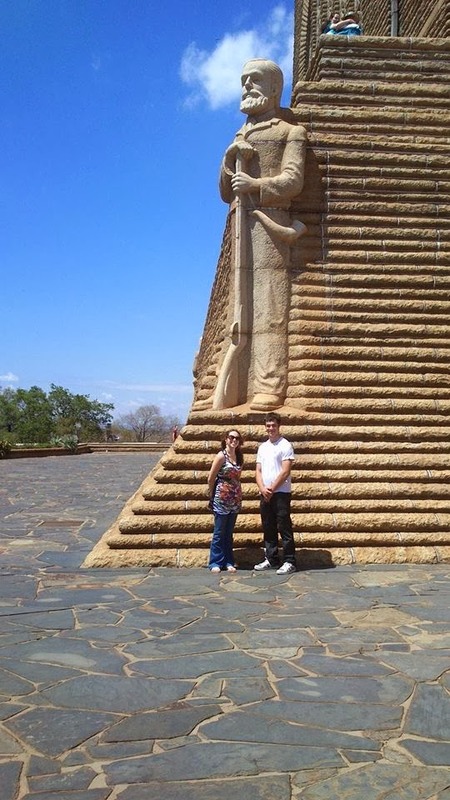 My wish for my 48th birthday was to take my family to the Voortrekker Monument. They have never been there. There's a new entrance to the monument, so the drive to the top was short and not as steep. My children's reaction to the monument made my day. They really admired it for what it was. My son said: "This place is awesome." 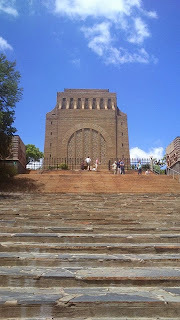 There's an elevator inside, which takes tourists/visitors to the top now, but I made my family climb the stairs. When we got to the top, I stepped forward and looked down from the balcony to the garden below. I'm proud to say, I don't share his fear for heights. I have always tried, in every possible way, to enrich my children with knowledge, much like my father had done with me. Going to the monument made me appreciate him. He died at a very young age and my children do not know him at all. My eldest child was born two years after his death. I tell them a lot about him. I think, in more ways than one, I am a lot like him. So, I have the opportunity of showing them who he was through my words and deeds. Our visit to the monument today was a walk back in time, but it defines the future. One day, perhaps, my children will take their own children to the monument ... and history will repeat itself. My husband is a year older than me. It was his first visit to the monument, too. I'm glad that I was able to take my family there and share a part of our cultural heritage with them. You educate a man; you educate a man. You educate a woman; you educate a generation.” ~ Brigham Young.